One of the many benefits of OLEDs includes its manufacturability on rigid (glass) or flexible substrates. 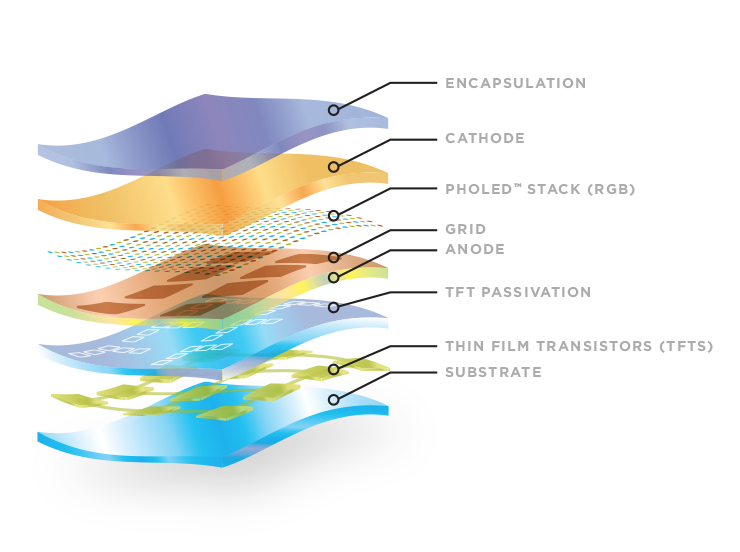 We are working on a number of technologies required for the fabrication of OLEDs on flexible substrates or FOLEDs. FOLEDs are OLEDs built on non-rigid substrates such as plastic or metal foil. This enhances the durability and enables conformation to certain shapes and even repeated bending, rolling or flexing. FOLEDs, still in their infancy, will usher in a range of new design possibilities for the display and lighting industries. Imagine having a mobile phone that looks like a pen but has a bright, full-color display that rolls in and out for use. We call that the Universal Communication Device™ (UCD). Open your imagination to what consumer and lighting products can be, including a foldable smartphone that could open up into a tablet display, a television that could roll up into your pocket, and conformable transparent interior lighting panels that could be unbreakable. These ideas offer, we believe, a mere glimpse into the wonders and possibilities that FOLEDs engender. History. In the late 1990s, our research partner at Princeton University discovered that small-molecule OLEDs could be built on flexible substrates, such as thin plastic. Since then, our team has led the development of this very exciting next-generation technology. Thinner and lighter weight – Built on very thin plastic or metal foil, FOLEDs can be much thinner and lighter than backlit LCDs and other displays in the market today. So cell phones, portable computers, wall-mounted televisions and other products with displays, can also be lighter and smaller. Plus, FOLED technology may allow easier installation of white OLED lighting tiles in more settings, and create novel uses in architecture that are not possible with today’s fluorescent and incandescent lights. More durable, safer and impact resistant – Glass breakage is a major issue of display-containing products and a key safety concern in the lighting field. Plastic and metal-based FOLEDs essentially eliminate these issues, creating obvious advantages in both displays and lighting. Flexible – Depending on the thickness and intrinsic properties of the flexible substrate, FOLEDs can be made to be bendable, conformable, rollable and foldable. With continued development, FOLEDs will be made to flex routinely for use in such products conceptualized as the UCD. Cost-effective – Today, OLEDs typically use production techniques that rely on the sequential processing of discrete glass panels. With flexible substrates that typically originate in a roll-stock format (like paper rolls), it is envisioned that FOLED production may evolve to higher throughput, roll-to-roll processes, as commonly used in the printing industry. This may provide the basis for truly low-cost mass production.